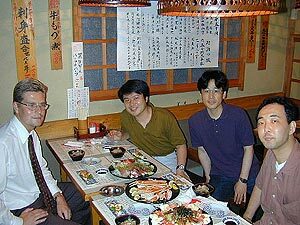 In summer 2001 I had a chance to visit Tokyo. Besides business, I was honoured to meet a group of Japanese DXers. We spent one Saturday evening together discussing our great hobby, enjoying superb Japanese seafood and - of course - drinking marvelous sake! Because sake tasted so good, I wasn't able to write down all the details we talked about. So after returning home we made an interview over the Internet with Mr. Hideki Watanabe, Mr. Tooru Gouhara and Mr. Takashi Kuroda. Please enjoy their views below! Fresh sushi and sashimi keeps you on the road. From left Jim Solatie, Masao Takahashi, Takashi Kuroda and Hideki Watanabe. My name is Hideki Watanabe, 36 years old, single Japanese. I am working at a company dealing with health foods in Tokyo. I started listening to shortwave radio stations back in 1979 and devoted into serious DXing around 1980. I was mostly listening to Latin American stations at first but started listening to medium wave radio stations after I moved to a town near the coast. I have been targeting Latin America on the shortwave and North America and South East Asia on medium wave since then. However, it is now rather difficult to do MW DXing since I live in an up-country town at present. I am Tooru Gouhara and I am 40 years old. I am married and have two kids (a son and a daughter). I am working at a company dealing with electronics, electric parts, plastics, chemical materials, labor-saving machines and many kinds of assemblies. My name is Takashi Kuroda, I am 39 years old and single. I am currently living in Tokyo and working at international division of a wholesaler and distributor of candies and snacks. I started SWLing back in 1975 with the Sony ICF-5900. My interest at the moment is UTE DXing, especially digital modes. I started UTE DXing back in 1988. 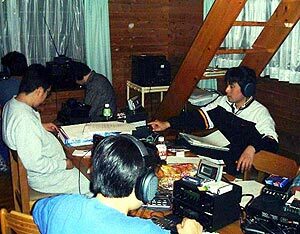 In addition to UTE DXing, I also often attend DX-Camps with my fellow DXers to listen to mediumwave and shortwave radio stations in a rural area. 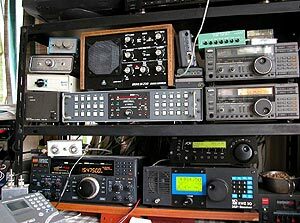 My current equipment is as follows: Receivers: Watkins-Johnson HF-1000A, Watkins-Johnson HF-1000, Icom R-9000, JRC NRD515 & 545, AOR AR7030Plus, Rohde & Schwartz EK890. Decorders: Universal M-8000 & M-7000 decoder, Hoka Code30DSP decoder Others: Timewave DSP-599zx, DX-One Pro antenna with a multiple antenna distributor. Jim: How did you get to know each other? We were exchanging information at first on a BBS (Bulletin Board Service) related to radio hardware at a Japanese computer online services company called Niftyserve. We made a first eyeball to eyeball meeting when I visited Takashi Kuroda in Tokyo who acquired the AOR AR7030 receiver for the first time in Japan from the U.K. After having met each other, we decided to form a club that we called AR7030 Ni Hohozuri Suru Kai which means "a club that likes rubbing his cheek against the AOR AR7030 receiver". We have been keeping contact with about 20 members since then. Jim: What are the main ways you enjoy DXing? I mainly enjoy catching long distance radio stations and testing the performance of home brew antennas. I have tested already Loop, Beverage, Rhombic and others. I recently begun to like the K9AY antenna. The directional performance of this antenna is excellent in my opinion. Medium wave DXing (the Philippines and Trans Pacific), collecting QSLs of medium wave and shortwave stations, collecting second-hand receivers, making a website on DXing, featuring QSL and other pictures, meeting with fellow DXers and attending DXpeditions. I am usually listening to aero frequencies, NAVTEX, military and diplomatic communications. I also listen to number stations such as MI6, CIA, or others. I also enjoy collecting surplus receivers. I used to own the Racal RA6790GM, RA6793A, RA1792, NRD240 and others. Jim: Which countries or continents are the most interesting ones to you? I am especially interested in the Philippine radio stations. It is because the official frequency list is available, but it is usually incorrect and you never know what you hear, which intrigues my curiosity. Besides, there is always room for new findings. USA and Canada by Trans-Pacific medium wave DXing. Radio stations in these regions sometimes give me responses for my reception reports although it is written in my broken English. In the MW DXing, I am interested in North Ameica. For the UTE DXing, I am interested in Europe as there are a lot of diplomatic communications. local stations or free from interference? NHK-1 is broadcasting 24 hours a day and also NHK-2 has extended its airtime. Korean stations are also on the air for 24 hours a day and there are no empty channels. However, I assume it depends on the region. 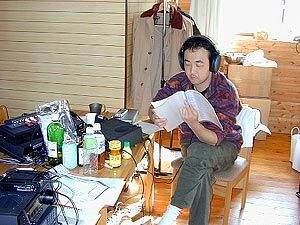 For instance, you can still listen to a considerable number of North American and South American MW stations in Miyako-City of Iwate Prefecture which is located about 600 km north of Tokyo. In addition, you can even listen to the Philippines better than Japanese local stations in Okinawa Islands which are located in the south of Japan. The Japanese medium wave band? It is HELL. There are too many Japanese, Korean, Chinese and Taiwanese radio stations on the band. I'm not interested in these areas and my main interests are Australia, New Zealand, the Pacific Islands and North America. I am also interested in mediumwave stations from Europe and the Middle East. Since there is a very strong MW transmitter site near my location, mediumwave DXing at my home is almost impossible. Jim: Can you please tell a little about your dxpeditions? 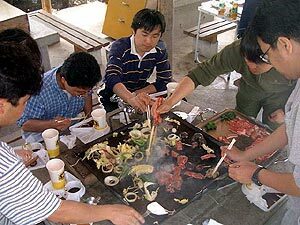 We usually hold a DX- Camp at Hasumuma in Chiba Prefecture located east of Tokyo near the Pacific Ocean. There are lodges facing the coast and it opens toward North-East to South-West directions. We usually stay there for 2 nights. We target Oceania and South East Asia in spring and North America in autumn. We enjoy DXing by drinking good beer, as well as rum, wine and spirits, too. Jim: How about FM listening? Which countries is it possible to hear on FM in Japan? There are conditions to Australia (TEP propagation), the Philippines, Vietnam, Thailand, Taiwan, mainland of China, South Korea, Mongolia, and the Russian Far East (ES). During May to June season, Chinese and South Korean FM stations are heard almost everyday here. Also some stations from Alaska have been heard in Japan! Finnish and Japanese DXers meeting in Tokyo; from left Hideki Watanabe, Kenichi Tanaka, Masao Takahashi, Jim Solatie, Pia Solatie and their kids playing with the latest Japanese toys. Jim: What are the best local FM and AM stations in Tokyo? I personally like best J-Wave on 81.3 MHz since the programs are targeted to adults. I do not listen to other FM stations as they are usually for young people. I do not listen to local AM stations as the programs are boring in my opinion. At least, ZIP-FM on 77.8 MHz and Radio i on 79.5 MHz are good for me. These stations are located in central Japan. Radio i is one of the finest FM stations for foreigners living in Japan. Perhaps the best Japanese AM station is JOLF on 1242 kHz. Many young listeners listen to JOLF's midnight programs. I like J-Wave on 81.3MHZ in Tokyo as it is more like an American FM radio station with a lot of music. On AM I listen to NHK-1 for the latest news. Jim: What about the future: how are you going to enjoy DXing in the coming years? I want to continue enjoying MW DXing at DX Camps in the coming years. I am currently busy with making my private website on DXing. I will continue UTE DXing. 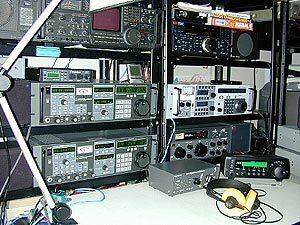 I am also interested in using PCs with DXing such as controlling radios and decoders with my notebook or desktop PC. Jim: Thanks a lot guys for the interview! We all wish you great conditions and wonderful moments with this fabulous hobby. Published on August 4, 2002. Photos © Jim Solatie 2001.